I guess it was around this day back in 1987 that I began judging people’s musical tastefulness based on what they declared was their favorite Elvis song. He wrote a Chicago Tribune column which I ignored because I thought it was a common snoozer and because I believed it was foolhardy for anyone within 500 miles of Mike Royko to bother writing columns as long as the Royko did. And Greene worked just down the hall from Royko. Greene, by the way, was dismissed in disgrace in 2002 when it came to light he was taking 17-year-old girls to hotel rooms to cuddle. But then, as now, I was always eager for any distraction that would keep me from doing actual work, so when a buddy of mine told me to read a Greene column about Elvis’s music I was happy to do so. Twenty-six years later, many of the lines are seared into my brain. It was a great column. 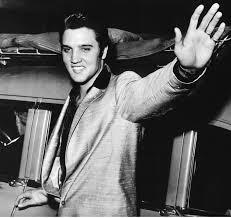 On the 10th anniversary of Presley’s death at 42, Greene referenced a news story that asked about 50 mid-80’ celebrities to name their favorite Elvis song and Greene made editorial comments. “Hound Dog” fans included Don Johnson, Phyllis Diller, Paul Newman and Moses Malone. But most of the column dealt with the song literary giant Norman Mailer selected as his favorite. Greene was incredulous. He gave Mailer his due for his success as a writer, his awards and acclaim, but then turned on him for his Elvis song choice. And it’s the only thing I remember Greene ever having written and if today anyone asks me to mention one interesting fact about Bob Greene I’d tell the story of how he’d play footsie with high school girls who came to him to learn about what it took to be a writer -- and I’ll bet he didn’t mention the part about being creepy around kids. But ever since that day I’ve felt the need to be prepared in case anyone was going to judge me based on my favorite Elvis song. I love Elvis. Today at Graceland they are commemorating his death with another candlelight vigil to be attended by 100,000 fans. One of them is Tony Yoken. He’s the Sirius XM announcer for the all-Elvis radio channel. I asked if he could provide a list of the most played songs and he did, but he was unable to gauge an actual ranking. Pick any of them and you’ll be sure to avoid scorn. But to be cool, you need something a little edgier. Feel free to choose from my list, one I’ll play on the channel if it ever considers me for the guest DJ role Yoken so graciously mentioned. What’s my favorite Elvis song? I’d have to say “Jailhouse Rock,” but I always turn it up when these comparative rarities come on. • “Such a Night” -- With vocals that range from coy to euphoric, this 1960 hit always gets me twitching. • “Are You Lonesome Tonight” -- Not the version you're thinking of, although I love that one, too. One of the great things about the Elvis channel are the rich rarities. Apparently Elvis used to change the lyrics to this one in concert for laughs. For instance, he’d change the line, “Do you gaze at your doorstep and picture me there?” to “Do you gaze at your bald head and wish you had hair?” And he cracks himself up, gloriously so. He loses control and giggles his way through the rest of the song. Perhaps he was high. Either way, it’s hilarious. • “Hey Jude” -- I couldn’t believe it when I heard this the first time. It’s not good, but I love what it represents. If Elvis heard a song he liked, he’d call up the band and they’d record it. He just loved to sing. He does a better job with “Bridge Over Troubled Water” and, of course, “My Way,” but I find these oddball rarities irresistible. I think I even heard him singing some Dylan, as incredible as that seems. • “Polk Salad Annie” -- Greene was right. This song is awful. But hearing this one will always remind me of its cameo in this outstanding Ray Wylie Hubbard song, “Mother Blues.” Check it out. In it Hubbard says he’s ignoring a woman who’s pestering him to play “Polk Salad Annie.” Then he hears her say the song turns her insides into warm butter and makes her want to take off her clothes and dance around in her underwear, a statement that makes Hubbard go right into, “Down in Louisiana where the gators grow so mean . . .” It’s hilarious and proves that even at his worst, Elvis can never be ignored. Don’t worry, I’m not like Bob Greene. I won’t judge you. And your daughters are safe with me, too, and you’re welcome to chaperone in case anything I do makes you all shook up. Arnold & Elvis: Cool things raining on me! Why I want A-Rod to play! Play! Play!